Pirates! Fantasy and the great storytelling from a plethora of talented authors all set in a supremely crafted shared world, what more could one want. I love the Heroes in Hell series and the latest volume does not disappoint. From plagiarists to buccaneers, to the Devil’s own Reaper, to a search for the way out, to the hunt for the Unholy Grail there are tales aplenty in this volume; Shakespeare and Kit Marlowe, pharaohs, poets; murderers, heroes of war and water try and salvage what they may from the rising water (and I use that term loosely), the ever-shifting lands and realms of a Hell patrolled by something worse than even the Dark Lord himself. The Devil is trying to keep house in this chaos and the damned are… well….damned and trying to make the best of it, the worst of it and everything in between. The stories flow well enough, and the dark humour is apparent. Wellington and Napoleon as neighbours makes me chuckle and the clever punishments meted out never cease to raise a smile. This is Hell, of course, but it’s a hell with class. Arrgh! Shiver me timbers *whatever the hell that means…. The latest Heroes in Hell anthology has been blown by a Hellish Maelstrom onto these shores. Hell Week 2017 will be along in good time but for now here’s a taster. Perdition Goes Viral As Floods Overrun Infernity! Avast, ye readers! Here be Pyrates! Feast yer eyes on the cursed treasures before you! Hoist the skull ‘n’ crossbones! Walk the plank with hell’s sorest losers! Join the damnedest buccaneers and privateers ever to sail infernal seas. The depths of hell chill the boldest sinner as damned souls learn why the deeper in hell you go, the colder it gets. Come on down: Join us in the depths of hell where a few of our damnedest writers break every rule of perdition, resulting in longer stories overflowing with torment. Amid more horrific punishments than ever, only a few survive Satan’s cruellest purges, while hell’s bowels runneth over. Janet Morris, Chris Morris, Nancy Asire, Paul Freeman, Rob Hinkle, Michael H. Hanson, Joe Bonadonna, Andrew P. Weston, S. E. Lindberg, Jack William Finley come together to bring us piratical hellish adventures. Shakespeare denounces plagiarism but learns what’s in a name when Marlowe takes the blame, as Satan pronounces a penance built for two. Not even eleven flayed Rameses have a dry place to stand when blood overruns the Vile’s banks and Hatshepsut confronts history’s worst pirates, while Howard Carter seeks to loot yet another tomb before Germany’s Haeckel can take the credit. Attila the Hun and Admiral Nelson square off until the Iron Duke and Napoleon brave an expanding lake to take the tide at its flood. Daemon Grim, The devil’s Reaper, heads for Skull Island on His Satanic Majesty’s most infernal service to quench his taste for blood money, hell’s truest treasure. Jason and the Argonauts find that piracy in hell isn’t all it’s cracked up to be, as Medea proves you can’t teach an old witch new tricks. Elliott Ness and Frank Nitti tangle with Hell’s Demon Minister of Copyright Enforcement, who insists that the price for musical copyright violation be paid in severed heads, including the head of King James I of England, but not even decapitation can still those wagging tongues. Doctor Frankenstein and Quasimodo swashbuckle on a voyage through Hades, searching for a way out of hell, while the Fairbanks boys and Errol Flynn capture a real vampire on film, showing that hell’s damnedest actors are never ready for their close-ups. Fleet Admiral Ogle and his nemesis Bartholomew Roberts quest for a mythical bottle of wine which may prove once and for all that damnation is just a test of faith. Kit Marlowe loses his Rose while Shakespeare finds out that a cold day in hell isn’t merely a turn of phrase. Grace O’Malley, pirate queen, and Strongbow, 2nd Earl of Pembroke confront the Vilekings with the help of Shaka Zulu, but not even Brendan the Navigator can help the ghostly Children of Lir. Please tell us a little about yourself. I be the captain of the Mistral Thief. I’ve made me an honest fortune. (grins) It never seemed enough. (pauses) Now Eileen, that was a fiery lass to make into a fine pirate. It was Jas that was part o’ a longstandin’ debt ta be paid and irritatin’ at that. I threw him in tha brig and he carried on, shoutin’ and screamin’… for hours. (rolls eyes) Oh, did I mention he has a temper? More fierce than a tempest, and more quick ta appear. That boy is goin’ ta get himself in a heap o’ trouble one day. Will serve him right, if ye ask me. Describe your appearance in 10 words or less. I be a ruggedly handsome pirate, er, gent that is. Do you have a moral code? If so what is it? Moral code. (blank stare) By which ya mean, do I follow said laws? Only me own. Would you kill for those you love? I’ve killed for less. Would you die for those you love? Nearly did for one lass. What would you say are your strengths and weaknesses? I be smart, cunning, a clever negotiator o’ sorts. Weakness, have I none. Do you have any relationships you prize above others? Why? Tha only relationship I’ve had is with tha sea. Well, Eileen, but alas it was not meant ta be. Do you like animals? Do you have any pets/animal companions? Waste o’ time if ya ask me. What use have I for an animal on me ship? Do you have a family? Tell us about them. (groans) Aye. Tha whelp, Jas, is me descendant. (shakes his head) Tho’ at times, I’d call him more of a mistake than a man. Tha village idiot. Can you remember something from your childhood which influences your behaviour? How do you think it influences you? Uh, somethin’ from me childhood? (beads of sweat form on his brow) Nay. Nothin’ of interest to ye. I was but a humble lad, makin’ me way an’ me fortune on tha Swallow. I ‘ventually … commandeered me own ship, the Mistral Thief. Do you have any phobias? Nay, I fear nothin’. Please give us an interesting and unusual fact about yourself. Interestin’? Such as when I freed tha air god to possess that boy’s body? (coughs) Ah, I jest! I did manage ta transform Jas inta a right true pirate. I thought Eileen had done well, but Jas… Hate ta admit it, but he took to it like a fish ta water. Took me years before I could captain me own ship. For Jas? Months. ‘course, he was a wee bit motivated, his wife ‘n son…well, ye know. Does your world have religion or other spiritual beliefs? If so do you follow one of them? Please describe (briefly) how this affects your behaviour. I follow me own rules. Before Pete, I believed nothin’. Gods and goddesses? Never thought I’d see tha day… Changes nothin’. Do you travel in the course of your adventures? If so where? Reveal me hideaways? I’d sooner kill ya than do that. Press tha issue and ye’ll be meetin’ Davy Jones personally. Name and describe a food from your world. Grog, Rum. Any spirit will do. Does your world have magic? If so how is it viewed in your world? Aye. Daria, Pete and tha soul trap. That be tha magic I’ve seen…and wish ta forget. Not many know it exists. Don’t much care that they do. Changes nothin’ fer me. What form of politics is dominant in your world? (Democracy, Theocracy, Meritocracy, Monarchy, Kakistocracy etc.) Politics? (snorts) I be a pirate. Me word is tha only democracy needed aboard me ship. Name a couple of myths and legends particular to your culture/people. A changeling, steals children, feeds on their souls. But I discovered, feeds on any human. What is the technology level for your world/place of residence? What item would you not be able to live without? Technology? What be that? Does this haveta do with that ‘in her net’ or ‘he male’ Eileen was prattling on about? Does your world have any supernatural/mystical beings? Please tell us about some. Listen hear, mate. I believe ye be repeatin’ yerself. Magic, gods and goddesses, myths and legends, I answered ye straight and true. Do ye doubt me word? No? Perhaps ye are an addlepate. Author notes: Second on the Right is a fantasy novel which delves in the origin of Captain James Hook and his motivation to seek revenge on Peter Pan. All is not as it seems. This is not your typical J.M. Barrie Peter Pan. The novel is set to release on Barrie’s birthday, May 9th of 2014. 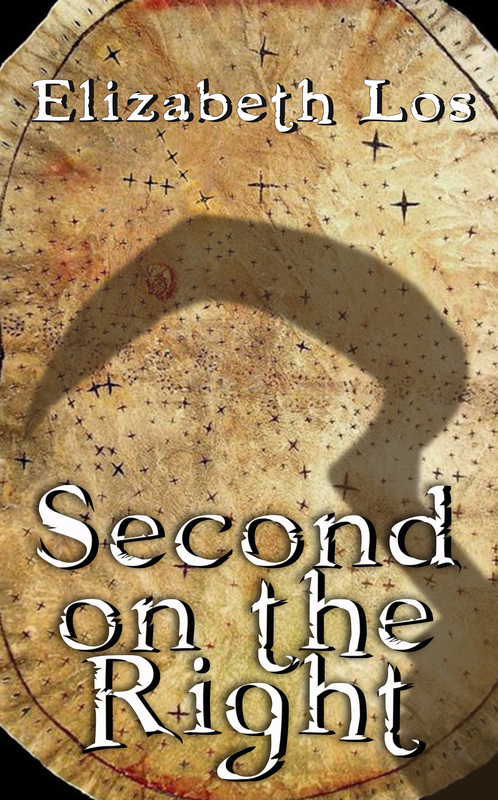 LA MIRADA, CALIFORNIA — Local author and cancer registrar Elizabeth Los of La Mirada, will debut her fantasy novel, Second on the Right, May 9, 2014. Spawned from an ancient promise, treachery and intrigue follow the protagonists through our world and one lost to the waves. Bound by an invisible bond, they are thrust into a fantastical world of pirates and demons. James Benedict is a just man haunted by evil. Pushed to the edge, everything stripped from him, a new man arises . . . a man whose name strikes fear into the hearts of all who hear it: “Captain Hook”. Eileen Davis was a timid woman. Through a fateful cruise she finds herself in the company of the Captain of the Mistral Thief. With his guidance, and the meddling of the local barista, she eventually finds her inner strength. Will the two of them unite through time to fulfill the promise of their ancestors or will tempers ignite leading all to failure? Second on the Right is Elizabeth’s first novel that lives up to the high standard that J.M. Barrie began. Elizabeth holds a degree in Cancer Information Management as well as General Management. She plays the piano for a local church, provides computer support for family, friends and work, cares for sick animals when the need arises and raises two children, all while working full-time. Elizabeth conducts author interviews and reviews books, films and albums on her blog, http://www.elizabeth.com, and founded “Genre Specific Review Group”, a Goodreads community group aimed at helping other indie authors. Elizabeth is available for interviews and appearances. For booking presentations, media appearances, interviews and/or book-signings contact authorelizabethlos@gmail.com.